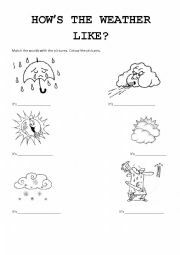 Students have to write the names of some hobbies, fill in gaps with present simple, present continuous, name the seasons and the months and then write sentences about the weather in each season. This ws was made for very young students. 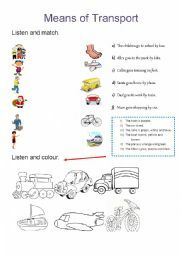 They have to listen to the teacher and match the pictures in both columns and then they must colour each picture (of a transport)in the right colour, after listening to the teacher. Your students have to match the description given with the pictures of famous actors and singers. 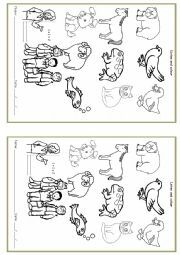 After listening to the Brown Bear story students colour the animals with their original colours. Students must read a paragraph and fill in a table with information from the text. THey also have to produce a paragraph with information from a table. 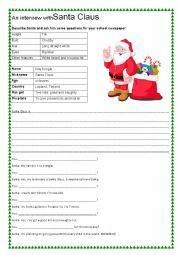 Students have to describe Santa Claus for an interview and then ask him some questions. 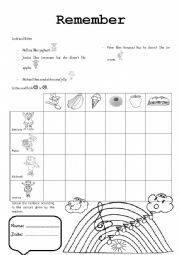 Students have to fill in the blank spaces with the given words, write the months of the year and draw pictures related to each month. They can colour the pictures. 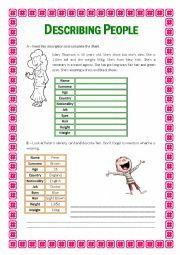 THis worksheet is to rememeber young learners vocabulary they have already learned. Students listen to teacher reading the sentences then they complete the table. After that they colour the rainbow according to the colours said by the teacher. 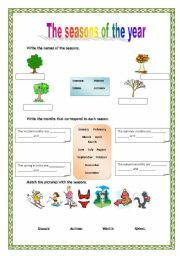 Students have to identify the seasons of the year, write the months of each season and matc some pictures with the correct season. This ws has a clothes pictionary,then the students must colour the pictures and after that write the clothes of the cartoons and say the colour they used. THIS IS A GAME i�VE JUST MADE. IT�S MY FIRST. ST HAVE TO CHOOSE THE BEST OPTION WHEN FACING THE PICTURES.HOPE YOU LIKE IT. 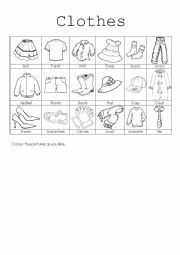 Students must listen to the vocabulary the teacher reads and then repeat it and at the same time associate the words to the pictures. It�s a powerpoint which presents some of the prepositions of place with images.I�m sorry I had to cut it short and without colour otherwise I would not be able to upload it.